Green Goblin: A Lighter Shade of Green collects all of the major appearances of Philip Urich as the Green Goblin. 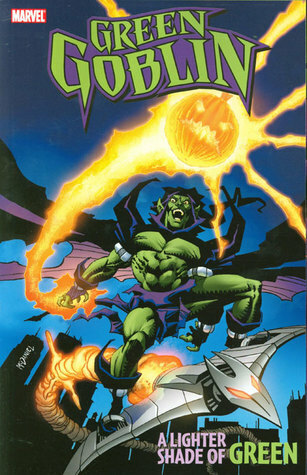 This includes the thirteen issues of the Green Goblin series from 1995-1996 as well as a couple of appearances this incarnation had in other comics. What makes Philip Urich's tenure so remarkable? The fact that this Green Goblin was a super hero! And he could not be any more different than the Osborn incarnations we're all familiar with. In this story, unlike what he is today, Philip Urich is presented as a goofy and happy-go-lucky twenty-something with little idea of what he wants to do with his life. Becoming the Green Goblin more out of circumstance than anything, Philip quickly discovers that he is completely out of his league when it comes to using any of the Goblin gear. This collection traces our unlikely hero from his first comical missteps – he crashes the glider with alarming frequency - to his development as a relatively competent super hero. Anybody familiar with the 80s TV series “The Greatest American Hero” will recognize that the Green Goblin series shares the same central concept and basic plotline.When a comic reuses an already well-known plot, it is not usually seen as the most original of ideas. But in this case, that is not necessarily a bad thing. While the plot has been done before, much of the humor comes from the fact that it is now the Green Goblin in the role of befuddled would-be hero. To see the Green Goblin appear on the scene in full gruesome glory and then do something completely embarrassing, like crashing his glider into a nearby wall, makes for great irony. This is heightened by the fact that the original cartoonish Goblin garb has been replaced by a more fearsome and threatening design. This type of story is not going to suit everybody. If you are specifically looking for a story which highlights the psychopathic evil of the original Goblin, you will probably not enjoy this collection. If the way in which the comic makes light of that aura of villainy that surrounds the Green Goblin does not appeal to you, then you may want to consider passing.But if you are willing to laugh a little (or a lot) at the Green Goblin, you will probably enjoy this take on the character. I was admittedly somewhat skeptical about the possibility of reinterpreting the Goblin as a hero, but the charm of the story quickly won me over. I enjoyed the shake-up of the Goblin concept and found that Philip Urich was a character I wanted to spend time with even when he wasn't flying through the city on a giant metal bat. It is understandable that some people may want to pass on this interpretation of the Green Goblin, but if the concept at all intrigues you, you should take a chance on this collection. The "Greatest American Hero plot" might not be the most original these days, but this is one of the few that succeeds in using it for what it is intended to do; to refresh the original concept and make you look at it in an entirely new way. I don’t think I’ll ever look at the Green Goblin in quite the same way again, and for me at least, that just adds another dimension to my favorite comic-book character. Begins with the Scarlet Spider and ends with Onslaught. If those don't mean anything to you, this isn't a book you will enjoy.Even then, probably STILL not for you. The writing is incredibly repetitive. Each issue, the hero has doubts about whether he should be a hero and then acts in a self-interested way. Ultimately he defeats the hazily sketched out villain and affirms his identity. There's little to no growth until some is shoehorned in when the series was cancelled. (I believe I was automatically resubscribed to Amazing Spider-Man when that happened. )The writers also completely misunderstood videogames and the Internet, which was a big theme in the Spider-Man titles to which this was related. Perhaps people in the 1950's felt the same way about the way radiation was depicted in the 1950's, but it looks laughable now. One last query: Why was Sonic the Hedgehog given a palette swap and Earthworm Jim looks the same?Still, I have fond memories and it's not super-bad. While one could argue the merits of turning the Green Goblin into a hero (one of Marvel's many experiments during the 'Clone Saga' era of Spider-Man), Tom DeFalco brings some light-hearted fun to the troubled Phil Urich and his struggles in the role. If you're a fan of DeFalco's work for Spider-Man or Spider-Girl, you'll probably enjoy this.The problem is DeFalco has done this before and done it better. The series also suffers from a bit of repetition (Phil has doubts, fights D-List villain, wins) and an abrupt ending due to the book's cancellation. Overall, it's not the best coming-of-age superhero comic, but it's still worth a look. Tom DeFalco Scott McDaniel Kevin Kobasic Darick Robertson Josh Hood Steven Butler Steve Buscema Terry Kavanagh - Tom DeFalco is an American comics writer and editor, well-known for his association with Marvel Comics and Spider-Man.